BACKTOFRANKBLACK.COM: Back To Frank Black goes independent! 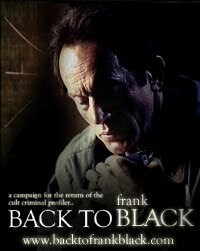 Back To Frank Black goes independent! BacktoFrankBlack.com is moving! Well, for you guys it isn't, but the site is spreading its wings somewhat behind the scenes! How does this affect you? Well, on the short term, the site may be down while the migration takes place -- maybe some teething problems -- but hopefully nothing we can't sort out in the next 48 hours from this post. Email works as always -- send us email to info@backtofrankblack.com if you have something to say! Again, this is short term -- one night at most, I hope. Monday will hopefully bring a new independent era to Back to Frank Black! What this post is really about is saying thank you to Graham Smith, who has let us use his server space for the past two years. Graham has always been generous with us, and indeed always been there to offer technical advice or very candid feedback on the campaign itself. I'm still in contact with Graham and through him and his network of This Is Who We Are, but on behalf of myself, Troy, Brian, Adam, Joselyn, Christina and, of course, Lance, thank you for looking after us. In particular, thanks for suffering many technical e-mails on the migration! You were a great help. So, Back to Frank Black is now sitting independent. Money from the t-shirts we've sold has enabled us to run the hosting for the campaign -- an indicator that money spent on the campaign does help the campaign and not our pockets. We're here independently because of you guys, so I guess that alone requires a big thank you from us all! Watch out for more news! The date for the charity auction is finally set! A post on that tomorrow -- plus an extension on the deadline for the Worldwide Fan Campaign! Eyes peeled my friends! Eyes peeled! 1 Response to "Back To Frank Black goes independent!" Good idea to extend the deadline. I think it allowed for a lot more entries in the poster contest.